UPTOWN — You might recognize the owners of Hot "G" Dog, a hot dog joint that opened in Uptown roughly two weeks ago. 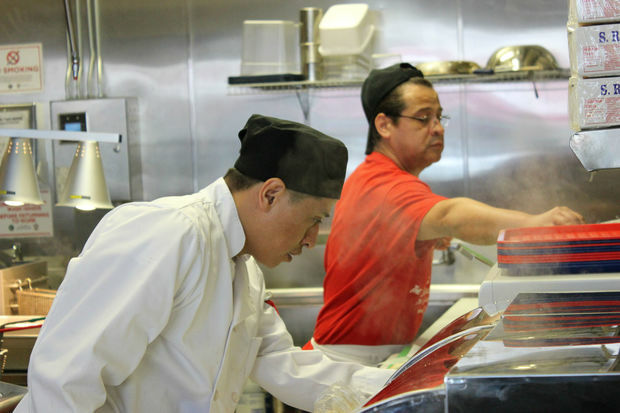 Juan Carlos Garcia and Octavio Garcia worked as two of the four line cooks at the now-closed Hot Doug's since "virtually day one," according to Doug Sohn, the owner of the former Hot Doug's. "They're total pros in the kitchen," Sohn told DNAinfo Chicago. "They made Hot Doug's as much as a success as I did." When Hot Doug's closed in October, the brothers, who live in Portage Park, decided to open a hot dog place of their own: Hot "G" Dog at 5009 N. Clark St. The "G" stands for their last name. Drawing inspiration from the Hot Doug's menu, they crafted a similar one, which includes everything from a Chicago-style hot dog to alligator, snake, foie gras and lamb sausages. There are also duck-fat fries. By using similar ingredients and the same sausage purveyor as Sohn, Chicago Game and Gourmet, Juan Carlos said they're creating almost identical food save for some different toppings here and there. Sohn approves, saying, "If people are upping the game and making better food as a result ... that's unbelievably flattering and a totally cool feeling." Octavio Garcia's son, who shares his name and works the cash register at Hot "G" Dog, said Sohn has had a huge influence on his family. "If it wasn't for Doug, me and my family wouldn't have what we have," he said. A former Hot Doug's customer traveled from suburban Morton Grove solely to check out Hot "G" Dog after finding out the Garcia brothers were behind it. "Chicago's been aching a bit since Doug wrapped up, but these guys will carry the torch," said Martin Arago, 27. Another Hot Doug's fan, Colby Turner, also from the suburbs, instantly recognized the Garcia brothers when he walked up to the counter. "These were the guys making the sausages, doing the work, so I trust them," he said. While the Garcia brothers wouldn't provide specific tips they learned from Sohn, they agreed that Sohn taught them everything they know about the fast food industry. "We try not to use Doug's name," said the younger Octavia Garcia, who translated for the brothers because they primarily speak Spanish. "We're not trying to take away from his fame." But according to Sohn, the Garcia brothers greatly contributed to the success of one of Chicago's most beloved hot dog joints. "I did not have to worry about what was going on behind me," Sohn said. "It allowed me to have an interaction with the customers and do that aspect of the job. I know that when an order was sent in, it would come out right." Sohn hasn't tried his former employees' food yet, but he said he's planning on making a trip to Hot "G" Dog soon. "Retirement is very busy," he said with a laugh. "It's certainly on my list to get up there. For one, I just want to see them. It's been a while."